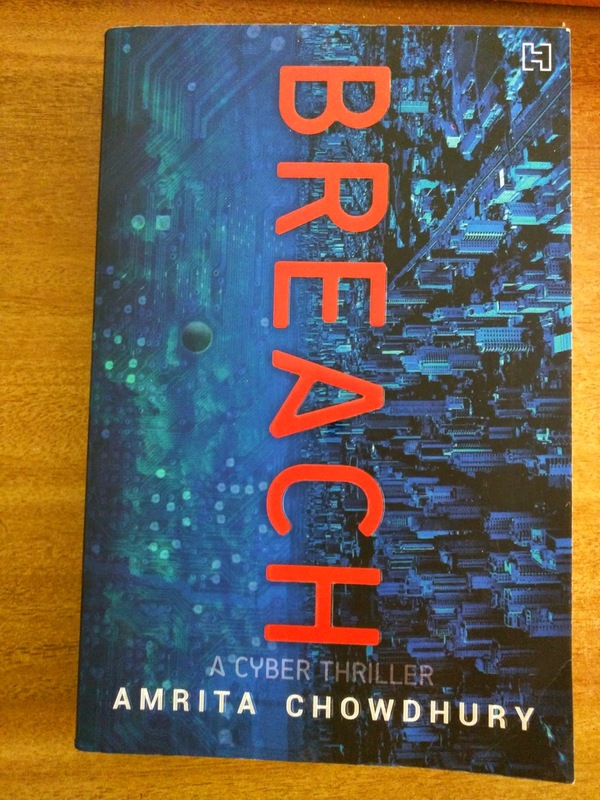 Breach is a Cyber Thriller written by Amrita Chowdhury (Yes that's how the surname is spelt). Amrita is also the author of 'Faking It', which I have not yet read (Adds to reading bucket-list). How secure are your secrets in the virtual world? Weeks before pharma-giant Acel is ready to file a global patent application for cancer wonder-drug Colare, its offshore data center in Mumbai is hacked. The charismatic young leader of its Indian business, Dr Udai Vir Dhingra, finds himself blamed for negligence and the breach of security. Battling market pressures, media scrutiny, livid American bosses and crumbling relationships, Vir must find the perpetrators or see his career - and his life- spiral downwards. But the deeper he gets dragged into the shadowy world of masked online identities and muddied digital footprints, the more Vir discovers that nothing is easy or obvious, and everything has a price. 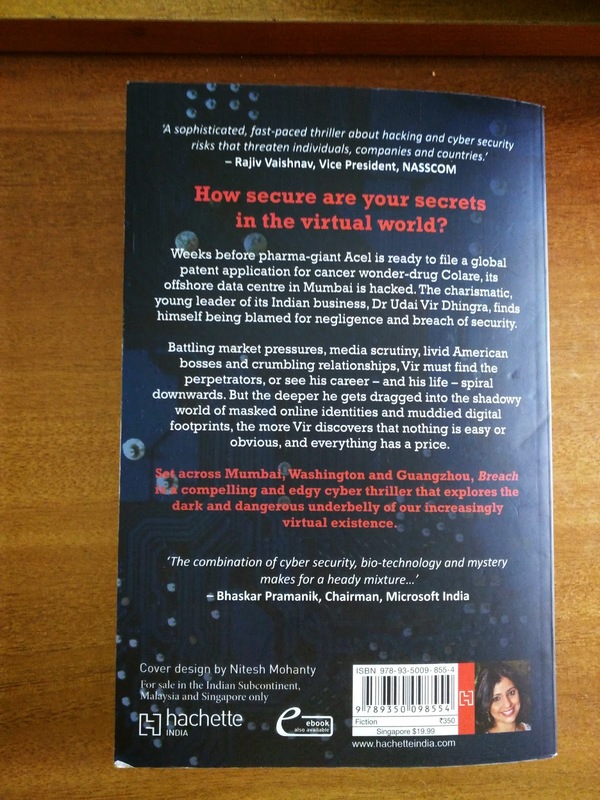 Set across Mumbai, Washington DC and Guangzhou, Breach is a compelling and edgy thriller that explores the dark and dangerous underbelly of our increasingly virtual existence. I am a total internet addict. So anything that has to do with cyber crime and the world wide web and gizmos, already had my attention. The front cover is a well thought blend of a metro-city and binary coding. Since the story revolves around medicine, I thought I might not be able to really understand or enjoy it, as I am really bad when it comes to Science. But Amrita has beautifully blended science, technology, crime and emotions. People can be biased about women writing with so much wit and intellect. Amrita breaks through all these biased judgements with her very well researched and cunningly put together story. I was blown away by things like how they communicated via a virtual game of scrabble to make sure no traces of communication are left behind; How the story jumps from Mumbai to Washington to Guangzhou but there is no confusion of any sort. Truth be told, this book reminds me of another book by another author - God is a Gamer by Ravi Subramanian. That too was a cyber thriller revolving around three different cities around the world. Anyways, coming back to 'Breach', this 300 something pages book is to be read like a movie, don't stop reading till it's over. I love how it is so very 'now', not something from the past or future but very much present in terms of technology, terminology, data-theft and other cyber crimes situation. Good one Amrita, looking forward to reading more of your power-packed books! I am grateful to Amrita for touching data breach topic. As the staff member of iDeals Solutions (www.idealsvdr.com) I want to emphasize the problem of the private account invasion, and also to underline that it should be given more attention to that issue by the law makers.